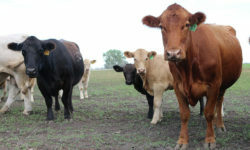 April live cattle had an outside day, trading above and below the previous day’s highs and lows. Though it was a volatile session, it does little to change our stance on the technical landscape. The bears need to continue to defend resistance that now comes in from 129.95-130.45. A close above here takes us to uncharted territory. On the support side, our first pocket remains intact from 127.50-127.675, a break and close below here opens the door for a round of long liquidation, with the possibility of a move towards 124.95-125.50. April feeder cattle got out above first resistance today, opening the door for a run at our next pocket from 148.50-149.00. This pocket represents the 50% retracement from the October highs to the December lows, along with the very top end of the recent range and other previously important price points. Tomorrow’s session will likely be pivotal in setting the down for the back half of the week. April lean hogs ran out of some steam today, but don’t go thinking that the top is in just yet. Sure, the market is overbought, but go back and look at an April 2014 chart. The market rallied from about 94 to 128 in the patter of two months, in that time frame there were only a couple of down days and the RSI got as high as 95.50. Sometimes the best trade is staying in cash, so if you don’t currently have a position, you may want to consider sitting on your hands just yet.